One of the most beloved family films of all time was released way back in 1939, but your average elementary school student today could probably tell you the whole story, describe all the characters, and sing most of the songs. The Wizard of Oz cost about $2.7 million to make, a very small price indeed for the revenue it has subsequently generated over nearly eight decades, not to mention the iconic place it holds in our popular culture. I remember growing up, what a red-letter event it was to watch it on TV. We didn't have cable or DVDs or even VCRs back then; heck, we barely got four channels! And you had to actually get up off the sofa and walk across the room to turn a dial on the television set! But I digress. You knew all your friends were doing exactly what you were doing on that one Sunday night a year: sitting on the living room floor with a bowl of popcorn, watching wide-eyed as Dorothy set off on the yellow brick road with her motley companions in search of the wonderful Wizard of Oz. It was magical and thrilling and terrifying and, well, wonderful. Then the powers that be drifted off into some poppy field induced stupor, no doubt drooling on themselves as they dreamed of their own Emerald City bank accounts, filled to overflowing with money carried in buckets by flying monkeys. All we need now, they thought, is a story and some clever dialogue and some expensive CGI, and we can get started. On second thought, let's not waste time with a script; we can start sooner if we just make this up as we go. After all, this story will practically tell itself! Everyone already knows the characters and the storyline, so we're just filling in a few blanks! 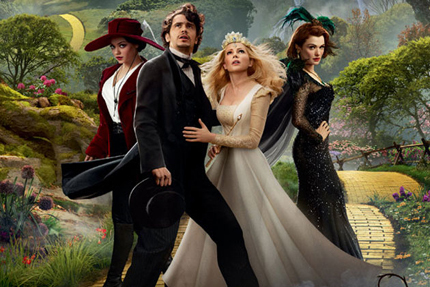 That is the only plausible explanation I can give for the enormous let-down that is Oz the Great and Powerful. The first five minutes of the film were actually my favorite, because it was a pretty clever black-and-white homage to all things Oz, with subtle references to L. Frank Baum and his series of delightful books that inspired the aforementioned movie. It was also shot in a 4:3 aspect ratio, consistent with movies of that day. And, in a not-too-subtle but still fun tip of the hat to the original, when the man who would be wizard arrives in Oz, the screen aspect widens and color floods the image. However, there are so many things wrong with this movie that it is difficult to know where to begin, but one consistently gnawingly bad component was the dialogue. Some people have a gift for writing dialogue that sounds natural, and some people don't. The writers of this tripe have a gift for writing dialogue that sounds like it was delivered by a kid who just flunked out of his third-grade creative writing class. Don't believe me? Here's a small sample, but you need to imagine that the words are also spoken by actors giving such stiff performances that the tin man suddenly seems like the most relaxed and limber member of the original movie. Theodora: Aren't you the great man we've been waiting for? China Girl: It's perfect. Thank you, Oz. Oz: Theodora, I know your wickedness is not your doing! And should you ever find the goodness within you, you are welcome to return! Unbelievably, there are two hours and ten minutes of conversations that sound just like those gems. Which, I suppose, you could tolerate if there was a really compelling story that grabbed hold of you and never let go. But half an hour into this movie I was ready to leave. In fact, if I hadn't been planning on reviewing it for this column, I would have left. Curse my deadline . . . The computer generated imagery in the film should have been remarkable. And it is: remarkably bad. Live actors talking with animated characters were hardly convincing, and when James Franco (the Wizard) speaks with various creatures throughout the film, it makes the interactions between Uncle Remus and Br'er Rabbit in 1946's Song of the South look downright realistic (a note to anyone too young to have seen that movie which is permanently in the Disney vault: you're not fooled for one second during the song Zip-A-Dee-Doo-Dah that the human beings are somehow looking at the cartoon bluebirds and butterflies fluttering around their heads). Our eyes are incredibly complex, and even watching somebody else's eyes allows us to know, instinctively, what they're looking at. So someone looking toward something that doesn't exist results in a particular look that our eyes pick up on as false, and we know that the thing they're trying to convince us they're interacting with isn't actually there. That's why it's really important to have something on set for actors to focus on, and then the CGI artists have the really hard job of selling it in post. In this case, it's caveat emptor. But perhaps my biggest issue with the movie was related to the wizard himself. In the original movie, when the curtain is pulled back by Toto to reveal a mere mortal at the controls, Dorothy scolds him severely for deceiving them and says, "You're a very bad man!" "No," says the wizard, "I'm a very good man. I'm just a very bad wizard." From the very beginning of this film, we realize that Oscar Zoroaster Phadrig Isaac Norman Henkel Emmannuel Ambroise Diggs (or OZ, for short) is actually a very bad man, but a pretty decent wizard. His idol is Thomas Edison, but he makes his living as a magician and con man, traveling with a circus and fooling people for a living as he figures out how to use clever gadgets and sleight of hand to separate honest folk from their cash. More odious, however, are his chronic and apparently successful attempts at separating attractive young women from their virtue. In the opening minutes of the movie, we witness him seducing a young woman by giving her a music box he claims once belonged to his grandmother, who died in the war. A little later, we realize (because a very angry strongman in the circus is prepared to kill OZ for something OZ did to his daughter) that OZ has a supply of music boxes that he uses to ingratiate himself with the young women he woos into his wagon. In fact, running from the angry father is what propels him to launch a hot air balloon into an oncoming tornado, which then, as you probably guessed already, spits him out in the Land of Oz. Within minutes, OZ has already met the first of three witches with whom he becomes entangled in one way or another. And before the night is over, she's in possession of a music box, and OZ has gotten something of hers, in return. Look, I could go on and on, but then you'd have spent more time reading this review than you would have spent if you'd just gone to the movie. So I'll promise to stop writing if you promise not to go see it. The original Wizard of Oz is so ingrained in my childhood, it's sort of the movie equivalent of comfort food. It reminds me of growing up with people who loved me and looked out for me. It reminds me of the peace and safety I felt at home with my family, which, I suppose, is one of the reasons that Dorothy's realization rang true: there's no place like home. And Oz is no place like home.